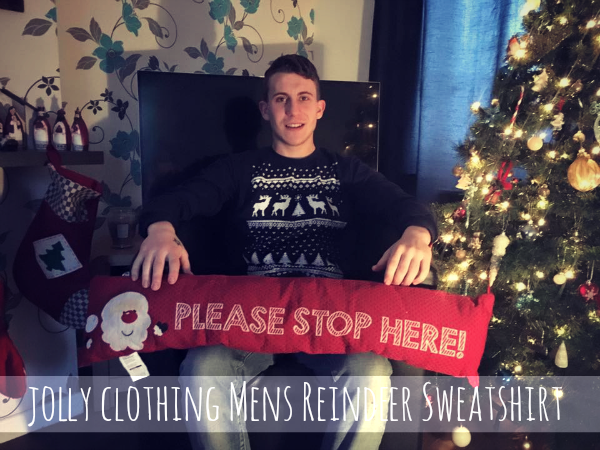 In 2010, a new phenomenon was born, a tradition that would take not only the UK, but the world by storm, a trend that quickly spread, and a fashion that was born and successful overnight, something that both children and adults alike would love, critics love them, and so do I, I'm talking Christmas jumpers of course! Then we moved on to Christmas clothing altogether, boxers, knickers, socks and tops, you name it, they (the fashion world!) made it! 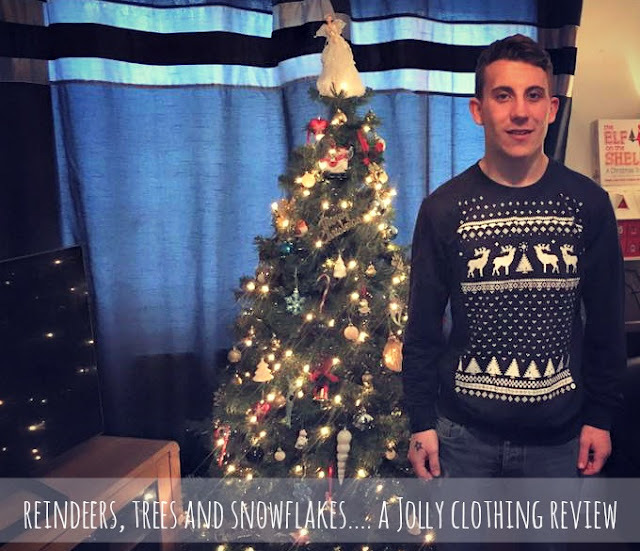 So when the people over at Jolly Clothing got in touch with me asking me if I'd like to review one of their items of clothing, and host a giveaway for my readers too, I obviously couldn't resist! I love Christmas!!! I wouldn't go as far as saying I'm the Christmas Queen, but if the role come up, I'd soon apply! I spent a good hour looking around the Jolly website, with a long list of items I'd shortlisted, I kept asking Gareth for his opinion, but wouldn't accept his view anyway, and then I realised I didn't even know if he had a Christmas jumper! I asked Gareth if he had a jumper, because it's become family tradition to wear a Christmas jumper on Christmas day, and he didn't, so the option was a lot easier, although it even took him a while to pick an item, even he was stuck between a few, and normally he's quick with his choices! Gareth's final selection was the Men's Reindeer Sweatshirt in Navy, pictured above with a pricetag of £22. So technically, it isn't a Christmas jumper, but we're both pleased with the choice, and couldn't imagine him wearing anything over than this sweatshirt when Christmas day arrives! 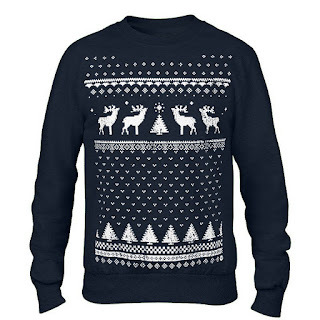 This original Jolly retro style reindeer sweatshirt is lightweight, super comfortable, and lovely to the eye, even for those who're not fashion followers! The sweatshirt is based on traditional fair isle, featuring reindeer, trees and snowflakes, with a distressed style print for an authentic worn look, it's the perfect alternative to the traditional Christmas jumper! We ordered the sweatshirt in a medium, and was pleased to of found, it fit really well, there was no lifting your arms above your head for the sleeves to roll down to your elbows, neither was there any bending over, to stand back up and have the sweatshirt rolled or scrunched up! As you can see from the image above, the back of the sweatshirt is plain navy, so the pattern doesn't continue, which is what both me and Gareth prefer! 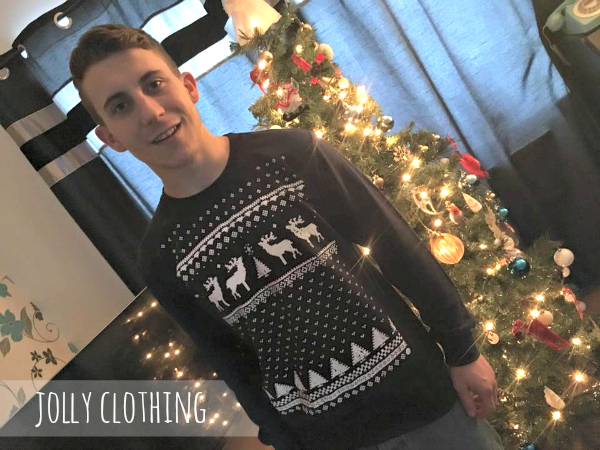 It's not OTT, it's not too thick, it's stylish, comfortable and the perfect Christmas clothing item that Gareth can't wait to wear for the whole of Christmas day! We loved the whole experience from Jolly, from the ordering process, right down to it being delivered through the door in a cute, stylish yet small branded box! We'd welcome new designs, but can't think of anymore ideas as they have lots already including Glow in the Dark ranges and festive tops! They don't serve just adults either, they serve for the smaller people amongst us and have an excellent children's range also! To be in with the chance of winning a pair of Jolly tops of your choice, please check out my competition post coming right up! To find out more about Jolly, check out the official website here!